To build the fastest motor we have brought in two Americans who have had decades of experiance with Nortons… Jim Schmidt and Jim Comstock. If you have ever been on any of the Norton discussion groups I’m sure you already know them. Jim Schmidt is the man behind JS Motorsport. He is a life long motorcyclist, riding minibikes as a kid and moving on to his first real motorcycle, a Triumph Cub, at age 15. After watching a few scrambles in the 60’s, he was foaming at the mouth to get on the track and won all 3 heats of his 1st race on a square barrel 441 BSA Victor. Jim became a sponsored rider and started working in the local BSA/Suzuki shop; Sumners in Fresno, CA. As scrambles turned into motocross Jim moved to 2-strokes, but gave it all up for college and music. By the time he hit 30, Jim had the motorcycle bug again and picked up an old Atlas. After porting and modifying the bike Jim was so impressed that he decided to take it to Willow Springs and competed in his first road race in 1982. He got hooked. The high point in his racing was taking 2nd at the 1984 AMA national at Laguna Seca BOTT 750; an all out class against Ducats, etc… Jim was on a very fast slim-line featherbed which featured home made 35mm guillotine slide carburetors and some very good port work. In 1984 he designed and built a monoshock frame for Nortons, patterned after the new monoshock Ducati’s. 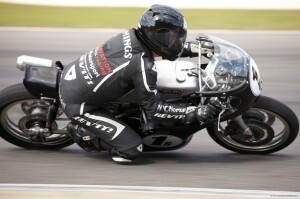 This was without a doubt the fastest and best handling Norton to ever get on the race track (at the time). However, he was hampered by a low budget, a close ratio 4 speed, and single front disc. The 850 motor ran well, but ran so hot he had to use a fuel mix of 75% alc and 25% gas. 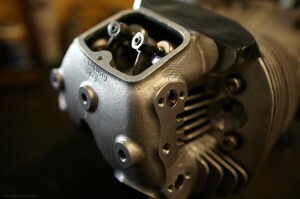 Jim made his first set of light weight pistons for the 850 monoshock using short Wisco blanks and shortened cylinders. They were about 260 grams compared to 317 stock, and knocked about 10 grams off the pins as well. Jim was doing well until the water-cooled Ducatis came out. By 1988 he had crashed a few times and decided to hang it up if he couldn’t be competitive. In the fall of 2007 Jim was nostalgic over his racing days and started looking into lightweight pistons to reduce the destructive vibration of Nortons (he was riding a teeth rattling cafe Atlas). After researching what NASCAR used, Jim drew up some plans for short lightweight pistons and longer bushless Carrillo rods with DLC coated pins. It was instant smoothness and after some hard testing, he decided to get back into the motorcycle game and market the piston kit. He sold his first set in 2008. It was on the discussion groups that he met Kenny Cummings. 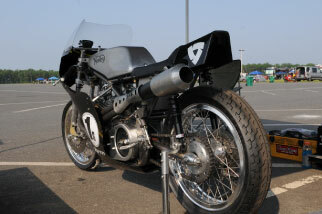 The two started a working relationship and made a lot of progress with Kenney’s race bike as a test bed. JS Motorsport’s focus is on the internal moving parts of the motor, as well as fuel and ignition system components. In addition to the rod and piston setup, he has developed the best valve train possible for the Norton Commando… All of which, you will find in our motor. Jim Comstock is well known on the Access Norton forum. You will always find him answering questions and giving good advise on how to get your old Norton running. Comstock bought his first bike, a Honda Super 65, in about 1968. 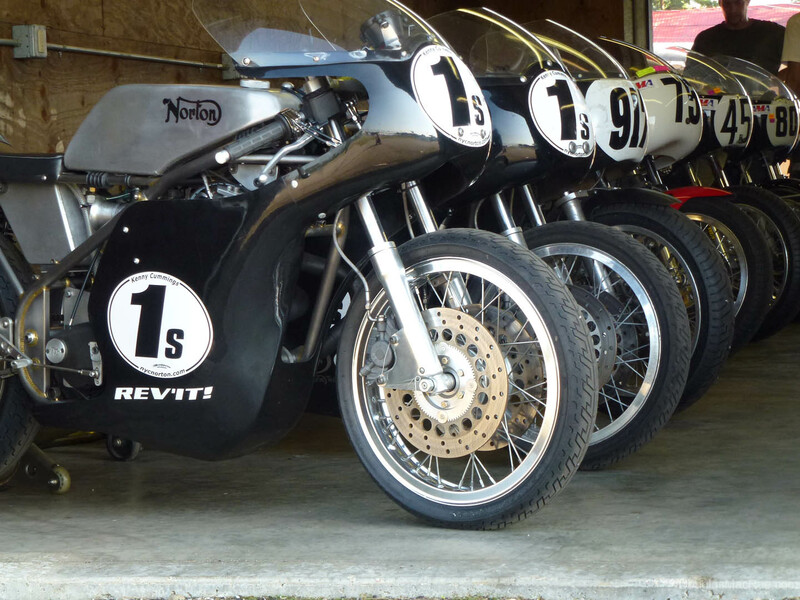 His first new Norton was in 1972, a 1968 N15CS that was still setting on the dealer’s floor. He still owns it. Jim started working on his own bike in 1968 and things went from there. Growing up on a farm in Iowa if you didn’t fix it yourself, it didn’t get fixed. Along the way he ran an automotive repair business for 25 years and got over the desire to have employees. 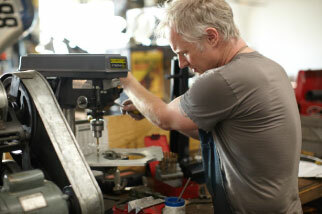 Now he works out of his own shop with Nortons as the only focus. Jim does machine work with a 4 axis CNC and a manual lathe and grinders, welding of any type, and a small amount of aluminum casting. His products include new MK3 starters, reed valve breather systems, head-steadies, hydraulic clutch kits, MK3 sprocket carriers and he has a few other projects in the works. 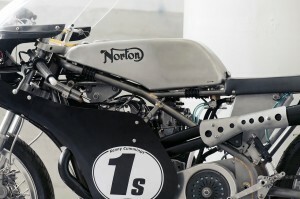 A more unique product that Jim builds is an electronic fuel injection systems for the Norton. His restoration work includes a lot of cylinder heads, as well as cylinder boring and ceramic coating on barrels. Jim does all the work himself other than anodizing on some of the new parts. The volume is low but he can control the quality better. Jim also has a Superflow dyno and computer flow-bench for development, which how our motor performs so well. The Fullauto head on our bike was flowed and ported on his bench and performs as well as any head you can bold on to a Norton commando motor. 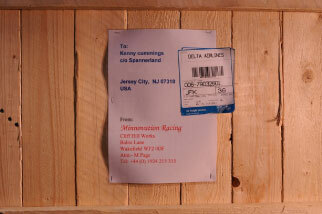 CNW is the retailer for the new parts produced by Jim Comstock.